It is not unusual for small to medium business managers to emulate Lewis Carroll's Mad Hatter, wearing six or eight hats simultaneously in their business efforts. Sometimes, the hat hardest to wear is IT management, which is important and challenging at the same time. All businesses, large and small, run on information: more importantly, available information. When that information is lost or access is interrupted, the impact on a business can be critical and sometimes fatal. According to analysts at Gartner, 40 per cent of businesses suffering a business interruption fail within five years. Potentially fatal data loss for a business puts a priority on protecting and securing business information. Small and mid-size businesses (SMBs) are often at a disadvantage when trying to adequately protect valuable business information, as they typically lack the budgets and internal IT of large corporate enterprises. Gartner estimates that less than half of all mid-size businesses and only 25 per cent of small businesses have disaster recovery plans in place. Smaller businesses face the same fundamental backup and data protection concerns as large businesses: What is the most cost-effective method to reliably protect and recover business-critical information? For many small businesses, the problem is even more difficult because they do not have an IT staff to design, deploy and manage data storage backup and recovery systems. The unanticipated loss of data is the reason to back up. The usual reasons considered for failure are earthquake, fire and flood, but in fact the more likely reasons are hardware failure, software failure, viruses and worms, and human error/mishandling. Small businesses (SMBs) are more vulnerable to human error and sabotage since equipment is often in an open office environment and is maintained by inexperienced staff. If a disk drive fails, the SMB could lose access to past invoices, purchase orders, inventory or shipping documents or essential accounting records. This is literally a business survival issue. The other essential question is: with all the material the SMB has on disk, what should be backed up. The temptation would be to back up everything whether it is a business record or not. But there is little business value in your aunt's photos from the Grand Canyon, or your niece's breakup trauma. Backing up everything makes good sense, but your best efforts should focus on records that change. A record, for the SMB and data center alike, is a document that contains the facts and relevant information your organization utilizes in its day-to-day operations. Without records, your organization could not make the many decisions essential to its success and could not plan for its future in an organized and systematic manner. Like almost any business event, SMB data backup must be goal-oriented. Time and effort needs to be invested in planning and execution of the business lifeline that is backup. The three types of backup are full (which backs up all files regardless of whether they have changed); differential (which backs up all files modified since the last full backup);and incremental (which backs up only files that have changed since the last backup of any kind). The first step is to identify and locate the files and folders to be included in a backup. Then, it is important to calculate the amount of storage space necessary to back up those files and folders, and possibly operating systems and application software. Next, the SMB must establish how large a backup window is available for executing the backup. Traditionally, backup was a "third shift" proposition where computer "dead time" was used for backup. Thanks to the Internet, orders and inquiries can be serviced any time of the day or night. There is less and less time for backup, even in that third shift. There are practical business advantages to a short, speedy backup window. Availability is one: the faster the backup, the more duty cycles can be assigned to operational or transactional computing. Efficiency is another: it is possible to avoid idling staff unduly. Therefore, thoughtful planning for a rational backup window is important. Finally, determine how the company's business information grows; reflect on a one and two year cycle. This will help the SMB select products that will scale over time & scalability is one sure way to keep up with data growth, which can be massive. The national averages vary between 25 per cent and 50 per cent growth per year, depending on the nature of the business and the complexity of the business infrastructure. With these basic questions answered, it is possible to work out a backup solution. The solution comes in two parts, the backup platform and the backup destination. Selecting the backup software must involve the goals of capacity management, scalability and speed discussed earlier. But there are other attributes that need to be discussed to make a sound business backup decision.Reliability is such an obvious attribute that it should go without saying. But solutions are a mixed bag, and the buyer needs to be aware of the degree to which the platform can be relied on. Longevity is likewise an issue. The buyer must be certain that the solution will last over time. Some backups will not have to be accessed for some time, and the software platform will still need to operate. For example tapes and CDs have a shelf life and this has to be taken into account for data storage and archiving. More importantly, technical support might be needed at some point in time. If the platform vendor is out of business, the SMB might be in trouble. Ease of use is going to be important both for the backup platform and the backup destination. In many SMB settings, the person charged with the backup is not an IT professional. The responsible party might be an administrative or clerical employee, a remote manager, or the owner of the company who wears all the hats. Managing data can be complex, but the backup subsystem should be as simple as possible to save staff time and training expense. Removability and portability are important elements of the backup destination. Whichever media is chosen, portability is important. Since backup is a disaster recovery (or business continuity) tool, an SMB should be able to remove critical data from the main business location at some point, where earthquake, fire, flood or even a human might take a toll. Whether it is stored in a bank vault or a financial officer's closet, portability creates an extra level of protection for that valuable information. For small businesses, cost is an always issue, an assertion that comes as a surprise to nobody. In calculating cost, it is best to include the platform, the destination, the time spent in backup versus the time it would take to rebuild lost data in a data outage situation, staff time investment and any relevant overhead costs. But SMBs are the darlings of the computer storage industry right now, with storage vendors competing aggressively for the SMB dollar like never before. Costs have never been better. One of the advantages of current backup technology is that the SMB has both the freedom and the burden of choice. But a careful examination of the different destination media will chart a course to the optimum SMB destination: removable disk. CD, the well-known Compact Disc, is an optical disc capable of storing data, although limited to a capacity of 650-850 megabytes. CD-ROM is a common format for software distribution. CD's first cousin, the DVD, is visible in the data storage market as well and while the capacity is higher than that of the CD, it is still limited to between 4.7 and 10 gigabytes. They claim to offer long service life and a comparatively low cost. But capacities are more limited than most magnetic storage solutions, and I/O speeds may not fit in with the SMB backup window. Additionally, CD media is fragile; scratching the surface loses data. DVD media is resistant to scratches, but is limited to a single level of error correction, casting a cloud on its reliability. And recordable CD and DVD media will degrade over time. Tape has been the workhorse of backup for 50 years. Tape drives have data capacities of anywhere from a few hundred kilobytes to several gigabytes, and varying transfer speeds as well. While tapes are a very portable removable storage solution, the disadvantage of tape drives is that they are sequential-access devices, which means that to read any particular block of data, you need to read all the preceding blocks. The wait to restore essential files in a disaster recovery situation would be unacceptable to many SMBs, for whom fast restore time can be of the essence in keeping a business going. This tape limitation is being recognized by OEMs, such as Dell, who are phasing out low-end tape solutions with limited roadmaps (such as DDS) as part of their offerings. Longevity of the media is also an issue: it is customary to relocate data to fresh tape every five years or so, and users often discover upon data recovery that the backup did not complete. Additionally, newer drives can be very costly, and might break the SMB budget. Fixed disk is another potential option. It is familiar, high speed, and not complex. But backup to another fixed disk is perilous. One fundamental challenge for hard disk technology is to prove its ability to provide cost effective off-site security, something of a hardship for a fixed disk technology. As well, disk drives are less scalable: what is to be done when the capacity limit is hit? The alternative is to daisy chain one disk to another, which drags performance fiercely. Unlike tape and removable disk, fixed disk technologies are not as portable as the alternatives and have to be handled carefully due to the drive mechanics being transported with the media. They are not built to be moved. The SMB needs more than just one backup: it's best to set up a schedule using a regular rotation system. Don't just overwrite the backup with the next backup. Any kind of glitch or error in writing the new backup can leave no backup at all. Ideally, three removable cartridges should be put in rotation to ensure proper protection. One cartridge should be kept in the dock so that a backup can be performed at any time; a second cartridge containing a recent backup in the event of an emergency restore; and a third backup cartridge should be kept off-site. Removable storage is not a new concept in the computer industry. Since the early 1980s, the industry has seen the standard floppy disk drive with the removable 3.5-inch diskettes. As computers and technologies have advanced over the years, removable storage technology has moved right along as well. Storage vendors can now offer reliable, cost-effective removable disk with capacities reaching from 40-160 gigabytes. Removable disks allow the SMB to enjoy the economics of low cost, rugged media and the ability to preserve backup data away from the primary storage in a most simplistic and traditional backup process. The most pervasive (available from several leading storage vendors "disk t o removable disk" storage line is based on ProStor Systems' (Boulder, CO) RDXÂ® technology. RDX technology is a 2.5-inch removable Serial ATA (SATA) hard drive that looks and acts like a tape cartridge, but performs with the speed and reliability of fixed disk. ProStor will refresh its cartridge capacities and speeds as new mobile hard drives are released from suppliers. (The company's technology reportedly works with any manufacturer's SATA drives.) RDX technology allows SMBs to upgrade to higher-capacity cartridges without having to buy new drives, preserving their technology investment and not requiring any forward migration of data. Newer, more affordable media such as Iomega Rev disks are a very appealing solution for small businesses. These media is remarkably robust, with a service life of 10 years and the ability to sustain a three-foot drop onto concrete. The cartridge itself will alert the SMB user that there is a problem either with the backup or the media so that when data recovery is performed, there are no surprises. As a random access medium, recovery from an RDX or REV backup takes milliseconds, in contrast to a much longer serial search on a tape cartridge. File retrieval is in seconds rather than hours. This type of removable disk technology takes every positive aspect of both tape and disk and combines them into one versatile product. At the same time, RDX sheds the negative characteristics of each media. RDX and Rev drives interoperate with all leading backup software. 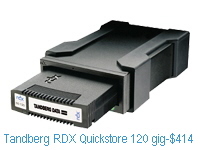 Iomega, a long time storage manufacturer introduced Rev drives and RDX drives and are available from Dell, Imation, and Tandberg Data (that recently completed the acquisition of Exabyte). RDX media from any manufacturer can be used with any RDX drive. In a world where litigation is commonplace, regulations are endless and business interruption can be business extinction, SMBs suffer as much or more vulnerability than the enterprise data center. This makes the selection of the best backup tools even more crucial. The solution must scale over time, be simple to use and as easy on the budget as possible. Portability is a crucial for taking data off-site and securing it away from the workplace. And, rotating the media will provide a structured backup plan that provides maximum protection for the information. Implementing that structured plan with removable disk media provides an SMB solution that is easy, affordable, scalable and reliable.